Background White matter hyperintensities (WMH), lacunes and microbleeds are regarded as typical MRI expressions of cerebral small vessel disease (SVD) and they are highly prevalent in the elderly. However, clinical expression of MRI defined SVD is generally moderate and heterogeneous. By reviewing studies that directly correlated postmortem MRI and histopathology, this paper aimed to characterise the pathological substrates of SVD in order to create more understanding as to its heterogeneous clinical manifestation. Summary Postmortem studies showed that WMH are also heterogeneous in terms of histopathology. Damage to the tissue ranges from slight disentanglement of the matrix to varying degrees of myelin and axonal loss. Glial cell responses include astrocytic reactions—for example, astrogliosis and clasmatodendrosis—as well as loss of oligodendrocytes and distinct microglial responses. Lipohyalinosis, arteriosclerosis, vessel wall leakage and collagen deposition in venular walls are recognised microvascular changes. Suggested pathogenetic mechanisms are ischaemia/hypoxia, hypoperfusion due to altered cerebrovascular autoregulation, blood–brain barrier leakage, inflammation, degeneration and amyloid angiopathy. Only a few postmortem MRI studies have addressed lacunes and microbleeds to date. Cortical microinfarcts and changes in the normal appearing white matter are ‘invisible’ on conventional MRI but are nevertheless expected to contribute substantially to clinical symptoms. 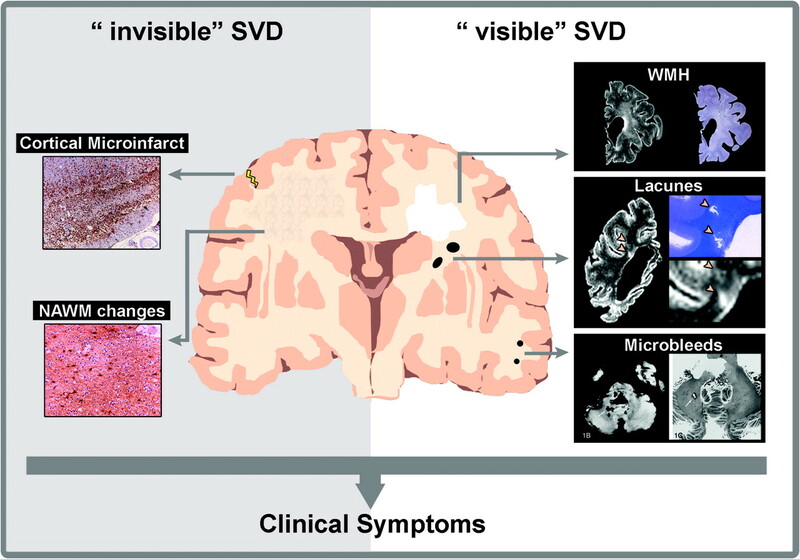 Conclusion Pathological substrates of WMH are heterogeneous in nature and severity, which may partly explain the weak clinicoradiological associations found in SVD. Lacunes and microbleeds have been relatively understudied and need to be further investigated. Future studies should also take into account ‘MRI invisible’ SVD features and consider the use of, for example, quantitative MRI techniques, to increase the sensitivity of MRI for these abnormalities and study their effects on clinical functioning. White matter hyperintensities (WMH), lacunes and microbleeds are regarded as MRI expressions of small vessel disease (SVD) and are commonly found on brain MRI of elderly subjects. WMH are visible as hyperintense areas on T2 weighted MRI scans (including FLAIR), while lacunes are identified on MRI as small cavities with a diameter of 3 mm to 10–15 mm, and signal intensities comparable with CSF. Lacunes are located in the white matter (WM) or subcortical grey matter and often have a surrounding hyperintense halo. Microbleeds are small, round, hypointense foci on gradient echo T2* weighted MRI and are mostly located in the basal ganglia or cortical–subcortical areas.1 2 Examples of these abnormalities are given in figure 1. Unfortunately, definition and quantification of these MRI expressions of SVD vary between studies. This warrants a standardisation of SVD rating on MRI, as extrapolation of results from different studies to more general conclusions may be severely hampered otherwise. MRI expressions of small vessel disease. Axial fluid attenuated inversion recovery images with periventricular and deep white matter hyperintensities (A); and an illustration of two lacunes in the right hemisphere (arrows) and deep white matter hyperintensities (B). T2* gradient echo image with multiple cortical–subcortical microbleeds (C). Thus SVD probably contributes significantly to clinical disability in the elderly. As it can potentially be treated or prevented, increased insight into the underlying pathological mechanisms of SVD is of paramount importance. A schematic representation of small vessel disease (SVD) expression is shown, including illustrative postmortem MRI and histological sections. SVD expression visible on MRI is illustrated as: a prefrontal coronal fluid attenuated inversion recovery (FLAIR) image and a matching Bodian Silver stained section of white matter hyperintensities (WMH); a parietal coronal FLAIR image and a Klüver–Barrera stained section of two lacunes (two arrows in the magnification); and a cerebellar axial T2* image and haematoxylin–eosin stained section of a microbleed (reproduced with permission from Fazekas, AJNR 199984). SVD expression that is not readily detected by conventional MRI includes: cortical microinfarcts, illustrated by microglial/macrophage activation on a HLA-DR stained section; and changes in the normal appearing white matter (NAWM)—for example, astrogliosis (glial fibrilary acidic protein stained section). Future studies should be directed towards assessing the whole spectrum of SVD because all expressions may contribute to clinical symptoms in the elderly subject. To better understand the pathological changes involved in SVD, postmortem MRI scanning and direct correlation with pathology is a valuable tool, as it bridges the gap between MRI findings and clinical studies.15 16 As it has been shown for other neurological diseases, such as multiple sclerosis,15 17 postmortem MRI histopathology correlation studies may help to solve the weak clinical–radiological associations in SVD. This paper aimed to investigate the published pathological substrates of WMH and other features of SVD, by comprehensively reviewing studies that have directly compared postmortem MRI and histopathology. Another aim was to pinpoint the gaps in our knowledge and provide the readership with suggestions for further studies, which will hopefully contribute to the development of future treatment options for demented and non-demented elderly patients suffering from SVD. A small proportion of patients with SVD features on their MRI suffer from genetic disorders such as cerebral autosomal dominant arteriopathy with subcortical infarcts and leukoencephalopathy (CADASIL) or hereditary cerebral amyloid angiopathy (CAA). These diseases have a distinct aetiology, and we will only focus on SVD that is observed in ‘normal’ ageing and AD here. We have systematically searched PubMed for scientific reports correlating postmortem MRI and histopathological assessment of WMH, lacunes and microbleeds until December 2009. The following search terms were used: postmortem, MRI, magnetic resonance, white matter (hyperintensities/lesion(s)), lacune(s), lacunar infarct(ion), microbleed(s). Studies having correlated postmortem MRI to histopathology of WMH are summarised in table 1. These studies confirmed in vivo studies, stating that WMH are highly prevalent (94%) in elderly populations.33 The first studies are small and descriptive. However, subsequent studies have specified WMH by distinguishing periventricular (PVL) versus deep (DWMH) WMH and the extent of DWMH (box 1). Early descriptive studies have claimed that postmortem MRI of 0.25 T to 1.5 T can already visualise WMH with sufficient image quality.16 18 22 However, the sensitivity of postmortem MRI does appear to be dependent on the size of WMH. Smaller punctate WMH, thought to have little clinical impact, can be less clearly visible on postmortem MRI.24 44 45 A sensitivity of 95% (range 87–99%) and specificity of 71% (range 44–90%) was found for PVL on postmortem T2 weighted postmortem MRI, which could be directly compared with myelin loss in Luxol Fast Blue stainings. For DWMH, the sensitivity was 86% (range 79–93%) and specificity was 80% (range 72–88%).31 44 Overall, postmortem MRI was considered a valuable technique for translating pathological findings to the clinical setting. Mild periventricular WMH presents with discontinuity of the ependyma, mild–moderate gliosis in the subependymal layer, loosening of the fibre network and myelin loss around so-called ‘tortuous venules’ and dilated perivascular spaces. No arteriolosclerotic vessel changes were found in these regions.24 30 Irregular PVL was shown to correspond to more severe, partly confluent, areas with varying fibre and myelin loss and reactive gliosis. Some complete infarcts were seen in irregular PVL regions, in combination with fibrohyalinotic and arteriosclerotic vessels. Punctate, early confluent and confluent WMH in the deep WM were found to be associated with increasing severity of tissue changes. In punctate DWMH, tissue changes were generally mild and confined to the area around dilated perivascular spaces with myelin loss and atrophic neuropil around fibrohyalinotic arterioles. In early confluent DWMH, perivascular rarefaction of myelin was accompanied by varying degrees of axonal loss and astrogliosis. In confluent DWMH, diffuse areas of incomplete parenchymal destruction were observed, together with loss of myelin, axons and oligodendrocytes, astrogliosis, spongiosis and focal transitions to complete infarcts.24 26–28 29 31 Examples of pathological samples with periventricular and deep WMH, defined on postmortem MRI, are shown in figure 3. Firstly, the role of hypoxia in the pathogenesis of WMH was investigated using specific markers for vascular morphology and tissue hypoxia.34 Thicker vessel walls and larger perivascular spaces were found in WMH. In DWMH specifically, capillary endothelial cells were found to be activated and an increased expression of several hypoxia markers was observed. Other studies on characterisation of afferent vessels showed arteriolar tortuosity and decreased vessel densities in WMH.32 49 These findings support an ischaemic pathogenesis of WMH, especially in DWMH. The most frequently reported cause of lacunes is acute arteriolar occlusion by arteriosclerosis/thrombosis but the existence of non-cavitated lacunes and the relationship with WMH suggest that there may be other pathogenetic mechanisms with a more gradual development.65 73 76–80 Possible alternatives include thromboembolism, general ongoing hypoxia or tissue damage by extravasated toxic serum proteins due to blood–brain barrier leakage.76 81 Future postmortem MRI studies with histopathological confirmation is warranted to further investigate these mechanisms. All of these findings suggest that SVD is a widespread disease and has various expressions throughout the brain of which only some aspects can be visualised with conventional MRI. As illustrated by figure 2, MRI ‘invisible’ pathologies, including cortical microinfacts and tissue changes in the NAWM, hence contribute to the clinical–radiological association that is found in SVD. Postmortem quantitative MRI: more specific for SVD related pathology than T2 weighted MRI? These few studies reveal that QMRI techniques may be promising in assessing tissue damage in vivo because they sensitively and specifically reflect the severity of pathological substrates and reveal tissue changes in areas that appear normal on conventional MRI (NAWM). This review has considered the pathological correlates of SVD, as reflected on MRI. The available literature suggests that several explanations may exist for the weak clinical–pathological associations. Firstly, pathological substrates of SVD expressions on MRI, such as WMH, lacunes and microbleeds, are heterogeneous in nature and differ in severity. Relative to WMH, postmortem MRI pathology correlation studies of lacunes and microbleeds are still scarce. For lacunes, pathological correlation studies are certainly warranted to be able to further investigate their hypothesised multiple aetiologies, including acute thromboembolism, continuing moderate ischaemia with eventual focal tissue loss and inflammation. For microbleeds, the pathogenetic mechanisms and their relationship with WMH and lacunes also needs to be further unravelled. It should be noted that in this review, we have only focused on normal ageing and dementia. In specific brain diseases, such as CADASIL and hereditary CAA, SVD features are also present but may differ with regard to their MRI and histopathology profiles. Secondly, until recently, clinical MRI studies have often focused on separate aspects of SVD, such as WMH, and found only weak associations with clinical symptoms. However, not only WMH but also lacunes and microbleeds are bound to contribute to clinical symptoms such as cognitive decline.3 6 Furthermore, the previously discussed MRI ‘invisible’ lesions—that is, microinfarcts and tissue changes in the NAWM—may be clinically relevant, independently of MRI ‘visible’ characteristics of SVD.93 The combination of SVD features is therefore a better predictor of cognitive decline than separate SVD expressions.100 Moreover, SVD should be assessed together with frequently coexisting large vessel infarcts, which may improve insight into the mechanisms of vascular cognitive impairment. In addition to vascular disease, other (degenerative) brain changes—for example, AD pathology, CAA or cortical Lewy bodies—may interact and modulate their specific contributions to cognitive decline.92 101–104 Future studies should therefore consider the full spectrum of SVD expression, together with vascular and degenerative pathologies coexisting in the ageing brain. Unfortunately, MRI sequences that are commonly used in radiological practice are insufficiently sensitive and specific to detect all the tissue changes related to SVD. Novel QMRI techniques, such as DTI, magnetisation transfer imaging, and T1 and T2 relaxation time measurements have two advantages over conventional MRI. Firstly, QMRI better reflects the severity of underlying pathological substrates. Secondly, it may better reveal clinically relevant tissue changes in the WM that appears normal on conventional MRI.39 40 QMRI techniques are therefore more adequate at reflecting the full range of SVD expressions. Several QMRI abnormalities were confirmed histopathologically, and these techniques are promising, pathology specific tools for future in vivo studies. It should be noted that, even though study logistics will become more complex, the use of fresh brain tissue in exploratory postmortem MRI studies is preferred above the use of fixed specimens, as formalin fixation has been shown to influence tissue proton relaxation characteristics. Unlike tissue changes in the NAWM, QMRI techniques have not yet been investigated to visualise cortical microinfarcts. The future use of high resolution MRI, using 7 T MRI scanners, may achieve in vivo assessment of these lesions, which are probably beyond the resolution of 1.5 or 3 T MRI. We would like to acknowledge Miriam Cornella, MSc, for her help with the literature search.
. Prevalence and severity of microbleeds in a memory clinic setting. Neurology 2006;66:1356–60.
. The Microbleed Anatomical Rating Scale (MARS): reliability of a tool to map brain microbleeds. Neurology 2009;73:1759–66.
. Small vessel disease and general cognitive function in nondisabled elderly: the LADIS study. Stroke 2005;36:2116–20.
. Silent brain infarcts and the risk of dementia and cognitive decline. N Engl J Med 2003;348:1215–22.
. Cognitive consequences of thalamic, basal ganglia, and deep white matter lacunes in brain aging and dementia. Stroke 2005;36:1184–8.
. Cognitive dysfunction in patients with cerebral microbleeds on T2*-weighted gradient-echo MRI. Brain 2004;127:2265–75.
. Clinical significance of microbleeds in subcortical vascular dementia. Stroke 2007;38:1949–51.
. Cognitive associations of subcortical white matter lesions in older people. Ann N Y Acad Sci 2002;977:436–44.
. White matter abnormalities in mobility-impaired older persons. Neurology 2000;54:1277–83.
. Association of gait and balance disorders with age-related white matter changes: the LADIS study. Neurology 2008;70:935–42.
. Urinary complaints in nondisabled elderly people with age-related white matter changes: The Leukoaraiosis And DISability (LADIS) Study. J Am Geriatr Soc 2008;56:1638–43.
. White matter lesions on magnetic resonance imaging in clinically diagnosed Alzheimer's disease. Evidence for heterogeneity. Brain 1992;115:735–48.
. Brain infarction and the clinical expression of Alzheimer disease. The Nun Study. JAMA 1997;277:813–17.
. Cortical microinfarcts and demyelination significantly affect cognition in brain aging. Stroke 2004;35:410–14.
. Cortical lesions in multiple sclerosis: combined postmortem MR imaging and histopathology. AJNR Am J Neuroradiol 2005;26:572–7.
. Correlations between histopathologic white matter changes and proton MR relaxation times in dementia. Alzheimer Dis Assoc Disord 1987;1:156–70.
. Magnetic resonance imaging as a tool to examine the neuropathology of multiple sclerosis. Neuropathol Appl Neurobiol 2004;30:106–17.
. Incidental subcortical lesions identified on magnetic resonance imaging in the elderly. II. Postmortem pathological correlations. Stroke 1986;17:1090–7.
. Deep white matter infarction: correlation of MR imaging and histopathologic findings. Radiology 1988;167:517–22.
. Brain MR: pathologic correlation with gross and histopathology. 1. Lacunar infarction and Virchow-Robin spaces. AJR Am J Roentgenol 1988;151:551–8.
. Computed tomography, magnetic resonance imaging and pathological correlations in a case of Binswanger's disease. Can J Neurol Sci 1989;16:214–18.
. Pathological findings correlated with magnetic resonance imaging in subcortical arteriosclerotic encephalopathy (Binswanger's disease). J Neurol Neurosurg Psychiatry 1989;52:1337–44.
. Periventricular lesions in the white matter on magnetic resonance imaging in the elderly. A morphometric correlation with arteriolosclerosis and dilated perivascular spaces. Brain 1991;114:761–74.
. The morphologic correlate of incidental punctate white matter hyperintensities on MR images. AJNR Am J Neuroradiol 1991;12:915–21.
. Comparison of postmortem magnetic resonance imaging and neuropathologic findings in the cerebral white matter. Arch Neurol 1991;48:293–8.
. Further observations on the pathology of subcortical lesions identified on magnetic resonance imaging. Arch Neurol 1992;49:747–52.
. Pathologic correlates of incidental MRI white matter signal hyperintensities. Neurology 1993;43:1683–9.
. Pathologic correlates of increased signals of the centrum ovale on magnetic resonance imaging. Arch Neurol 1993;50:492–7.
. MRI and pathological examination of post-mortem brains: the problem of white matter high signal areas. Neuroradiology 1994;36:393–8.
. Periventricular white matter hyperintensities on MRI: correlation with neuropathologic findings. J Neuroimaging 2000;10:13–16.
. Postmortem MRI and histopathology of white matter changes in Alzheimer brains. A quantitative, comparative study. Dement Geriatr Cogn Disord 2002;13:205–12.
. Quantification of afferent vessels shows reduced brain vascular density in subjects with leukoaraiosis. Radiology 2004;233:883–90.
. Vascular pathologies and cognition in a population-based cohort of elderly people. J Neurol Sci 2004;226:13–17.
. White matter lesions in an unselected cohort of the elderly: molecular pathology suggests origin from chronic hypoperfusion injury. Stroke 2006;37:1391–8.
. White matter lesions in an unselected cohort of the elderly: astrocytic, microglial and oligodendrocyte precursor cell responses. Neuropathol Appl Neurobiol 2007;33:410–19.
. Microglial activation in white matter lesions and nonlesional white matter of ageing brains. Neuropathol Appl Neurobiol 2007;33:670–83.
. Neuropathologic correlates of white matter hyperintensities. Neurology 2008;71:804–11.
. A semiquantative rating scale for the assessment of signal hyperintensities on magnetic resonance imaging. J Neurol Sci 1993;114:7–12.
. Diffusion tensor MRI post mortem demonstrated cerebral white matter pathology. J Neurol 2004;251:350–2.
. MRI with diffusion tensor imaging post-mortem at 3.0 T in a patient with frontotemporal dementia. Dement Geriatr Cogn Disord 2004;17:316–19.
. Heterogeneity of white matter hyperintensities in Alzheimer's disease: post-mortem quantitative MRI and neuropathology. 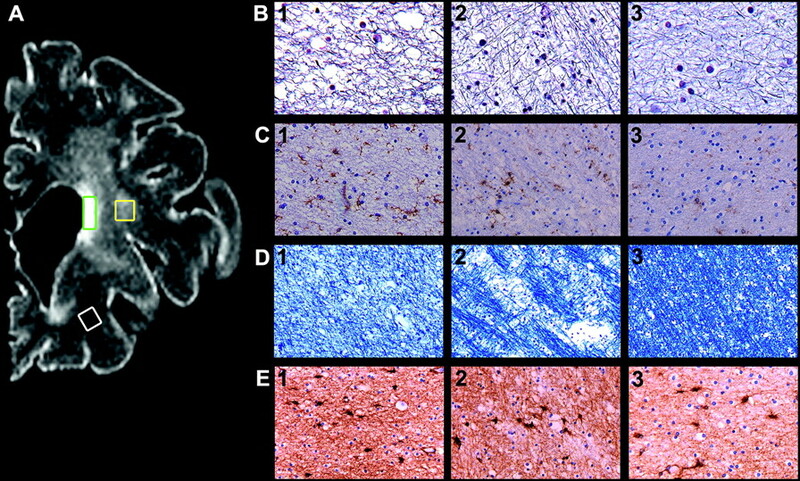 Brain 2008;131:3286–98.
. Postmortem MR imaging of formalin-fixed human brain. Neuroimage 2004;21:1585–95.
. Optimising imaging parameters for post mortem MR imaging of the human brain. Acta Radiol 1999;40:593–7.
. Comparison of the pathology of cerebral white matter with post-mortem magnetic resonance imaging (MRI) in the elderly brain. Neuropathol Appl Neurobiol 2004;30:385–95.
. Risk of rapid global functional decline in elderly patients with severe cerebral age-related white matter changes: the LADIS study. Arch Intern Med 2007;167:81–8.
. MR signal abnormalities at 1.5 T in Alzheimer's dementia and normal aging. AJR Am J Roentgenol 1987;149:351–6.
. White matter lesions and dementia: MRI-pathological correlation. Ann N Y Acad Sci 2002;977:411–15. Neuropathology Group. Medical Research Council Cognitive Function and Aging Study. Pathological correlates of late-onset dementia in a multicentre, community-based population in England and Wales. Neuropathology Group of the Medical Research Council Cognitive Function and Ageing Study (MRC CFAS). Lancet 2001;357:169–75.
. Venous collagenosis and arteriolar tortuosity in leukoaraiosis. J Neurol Sci 2002;203–204:159–63.
. Clasmatodendrosis correlating with periventricular hyperintensity in mixed dementia. Ann Neurol 2002;52:378–81.
. Alterations of the blood-brain barrier and glial cells in white-matter lesions in cerebrovascular and Alzheimer's disease patients. Stroke 1996;27:2069–74.
. Normal-appearing white matter in ischemic leukoaraiosis: a diffusion tensor MRI study. Neurology 2001;57:2307–10.
. Pathophysiology of age-related cerebral white matter changes. Cerebrovasc Dis 2002;(13 Suppl 2):7–10.
. Prevalence and pathogenic role of cerebrovascular lesions in Alzheimer disease. J Neurol Sci 2005;229–230:37–41.
. The influence of coincidental vascular pathology on symptomatology and course of Alzheimer's disease. J Neural Transm Suppl 1998;54:117–27.
. Impact of white matter changes on clinical manifestation of Alzheimer's disease: a quantitative study. Stroke 2000;31:2182–8.
. Histopathologic correlates of white matter changes on MRI in Alzheimer's disease and normal aging. Neurology 1995;45:883–8.
. White matter volumes and periventricular white matter hyperintensities in aging and dementia. Neurology 2000;54:838–42.
. Neuropathology of white matter changes in Alzheimer's disease and vascular dementia. Dement Geriatr Cogn Disord 1998;(9 Suppl 1):6–12.
. Amyloid angiopathy-related vascular cognitive impairment. Stroke 2004;35:2616–19.
. Vascular pathology in Alzheimer disease: correlation of cerebral amyloid angiopathy and arteriosclerosis/lipohyalinosis with cognitive decline. J Neuropathol Exp Neurol 2003;62:1287–301.
. Cerebral amyloid angiopathy: CT and MR imaging findings. Radiographics 2006;26:1517–31.
. Cerebral amyloid angiopathy, white matter lesions and Alzheimer encephalopathy—a histopathological assessment. Dement Geriatr Cogn Disord 2002;14:161–6.
. Relationships between arteriosclerosis, cerebral amyloid angiopathy and myelin loss from cerebral cortical white matter in Alzheimer's disease. Neuropathol Appl Neurobiol 2004;30:46–56.
. Lacunar strokes and infarcts: a review. Neurology 1982;32:871–6.
. Cerebral lacunae. A proposed new classification. Clin Neuropathol 1984;3:266.
. The enigma of vascular cognitive disorder and vascular dementia. Acta Neuropathol (Berl) 2007;113:349–88.
. Subcortical ischaemic vascular dementia. Lancet Neurol 2002;1:426–36.
. Infraputaminal 'lacunes'. Clinical and pathological correlations. Stroke 1995;26:1598–602.
. Distinguishing silent lacunar infarction from enlarged Virchow-Robin spaces: a magnetic resonance imaging and pathological study. J Neurol 1998;245:116–22.
. White matter changes in elderly people: MR-pathologic correlations. Magn Reson Med Sci 2006;5:99–104.
. Lacunes: small, deep cerebral infarcts. Neurology 1965;15:774–84.
. Incomplete lacunar infarction (Type Ib lacunes). Acta Neuropathol (Berl) 1998;96:163–71.
. Dilated Virchow-Robin spaces: MRI pathological study. Neuroradiology 1998;40:27–31.
. MR imaging and histologic features of subinsular bright spots on T2-weighted MR images: Virchow-Robin spaces of the extreme capsule and insular cortex. Radiology 2000;214:671–7.
. Is breakdown of the blood–brain barrier responsible for lacunar stroke, leukoaraiosis, and dementia? Stroke 2003;34:806–12.
. What causes lacunar stroke? J Neurol Neurosurg Psychiatry 2005;76:617–19.
. Two clinically distinct lacunar infarct entities? A hypothesis. Stroke 1993;24:652–6.
. Prospective study of single and multiple lacunar infarcts using magnetic resonance imaging: risk factors, recurrence, and outcome in 175 consecutive cases. Stroke 2003;34:2453–8.
. On the etiology of incident brain lacunes. Longitudinal Observations From the LADIS Study. Stroke 2008;39:3083–5.
. A combined hematoxylin–eosin, alkaline phosphatase and high-resolution microradiographic study of lacunes. Clin Neuropathol 1990;9:196–204.
. Spontaneous brain microbleeds: systematic review, subgroup analyses and standards for study design and reporting. Brain 2007;130:1988–2003.
. Cerebral microbleeds: clinical and pathophysiological significance. J Neuroimaging 2007;17:193–203.
. Histopathologic analysis of foci of signal loss on gradient-echo T2*-weighted MR images in patients with spontaneous intracerebral hemorrhage: evidence of microangiopathy-related microbleeds. AJNR Am J Neuroradiol 1999;20:637–42.
. Small chronic hemorrhages and ischemic lesions in association with spontaneous intracerebral hematomas. Stroke 1999;30:1637–42.
. Direct comparison of histology of microbleeds with postmortem MR images: a case report. Cerebrovasc Dis 2008;26:142–6.
. Correlation of hypointensities in susceptibility-weighted images to tissue histology in dementia patients with cerebral amyloid angiopathy: a postmortem MRI study. Acta Neuropathol Epub ahead of print 25 Nov 2009.
. Frequency and location of microbleeds in patients with primary intracerebral hemorrhage. Stroke 2000;31:2665–9.
. Cerebral microbleeds in CADASIL: a gradient-echo magnetic resonance imaging and autopsy study. Stroke 2002;33:67–71.
. Cerebral amyloid angiopathy and cortical microinfarcts as putative substrates of vascular dementia. Int J Geriatr Psychiatry 2006;21:681–7.
. Cerebrovascular pathology and dementia in autopsied Honolulu-Asia Aging Study participants. Ann N Y Acad Sci 2002;977:9–23.
. Pathological correlates of dementia in a longitudinal, population-based sample of aging. Ann Neurol 2007;62:406–13.
. Cortical microinfarcts and demyelination affect cognition in cases at high risk for dementia. Neurology 2007;68:927–31.
. MTI of white matter hyperintensities. Brain 2005;128:2926–32.
. Diffusion tensor imaging of post mortem multiple sclerosis brain. Neuroimage 2007;35:467–77.
. The effects of brain tissue decomposition on diffusion tensor imaging and tractography. Neuroimage 2007;36:64–8.
. Quantitative magnetization transfer imaging in postmortem multiple sclerosis brain. J Magn Reson Imaging 2007;26:41–51.
. Whole-brain T1 mapping in multiple sclerosis: global changes of normal-appearing gray and white matter. Radiology 2006;240:811–20.
. Focal white matter changes in spasmodic dysphonia: a combined diffusion tensor imaging and neuropathological study. Brain 2008;131:447–59.
. Sorting out the clinical consequences of ischemic lesions in brain aging: a clinicopathological approach. J Neurol Sci 2007;257:17–22.
. Medial temporal lobe atrophy and white matter hyperintensities are associated with mild cognitive deficits in non-disabled elderly people: the LADIS study. J Neurol Neurosurg Psychiatry 2005;76:1497–500.
. Assessing the cognitive impact of Alzheimer disease pathology and vascular burden in the aging brain: the Geneva experience. Acta Neuropathol 2007;113:1–12.
. Neuropathological basis of magnetic resonance images in aging and dementia. Ann Neurol 2008;63:72–80.
. The significance of medial temporal lobe atrophy: a postmortem MRI study in the very old. Neurology 2007;69:1521–7.